Dividend stocks can bring solid, consistent income to your portfolio for years at a time. That's why today (Monday), we've brought you one of the best investments for consistent dividend hikes. 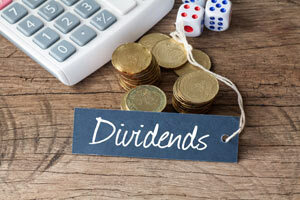 Before we get into of the best investments today, here's how lucrative dividend investing can be. Goldman Sachs research found that $100 invested in the S&P 500 Index in January 1972 would have grown to $1,585 by March 2012. That's a return of 1,485%. But if you had invested the same capital in dividend-paying S&P 500 stocks, you'd have $3,000 today. That's a return of 2,900%. And those gains could have been even higher. That same $100 invested in the group dubbed "dividend growers and initiators" would have ballooned to $4,031. That's a return of nearly 4,000%. And that's more than two-and-a-half times the amount an investor would have received by participating in a passive, index-focused approach. S&P Dow Jones Indices reported last month that dividend increases rose a collective $3.9 billion in Q1 2016. That was down 68.9% from $12.6 billion in the same period a year earlier. And dividend decreases in Q1 were up 95.6%. There were $18.7 billion in dividend cuts during the January to March stretch, compared to $9.6 billion in the same timespan a year ago. During this time, a stronger dollar weighed on multinationals' profits and oil prices continued to cause pain for many dividend payers. "For the remainder of 2016, pressure on both the Energy and Material sector issues are likely to continue, even if commodity prices stabilize and increase, resulting in more disappointing announcements," Howard Silverblatt, Senior Index Analyst at S&P Dow Jones Indices, said in a statement. The First Trust Nasdaq Technology Dividend Index Fund (NYSE: TDIV) offers dividend growth, diversification, and a way to invest in some expensive stocks that might otherwise be out of reach. TDIV is an exchange-traded fund (ETF) composed entirely of technology and telecom companies. Semiconductor firms make up 27.6% of the fund. Software and telecoms make up 15.4% and 14%, respectively. This $455 million market cap ETF includes 94 top tech dividend payers. Every pick has a market cap of more than $500 million – the threshold for inclusion. Other requirements are that they must have paid a dividend in the past 12 months, have a yield of at least 0.5%, and must not have decreased their dividends within the past 12 months. The top 10 holdings include market titans like International Business Machines Corp. (Nasdaq: IBM), Apple Inc. (Nasdaq: AAPL), Microsoft Corp. (Nasdaq: MSFT), and Cisco Systems Inc. (Nasdaq: CSCO). TDIV shares currently change hands at around $25. That is much cheaper than many of its holdings, thus providing a cost-effective way to tap tech dividend payers. "With this fund, you get to invest in good, old American innovation, which continues to lead the rest of the world," Robinson said. "And you get a nice, steady 'paycheck' to do so." In addition, you get what Robinson calls "volatility insurance." That is something all investors welcome in this confused market landscape. After all, the S&P 500 has dropped almost 2% in the last month. TDIV is truly an "invest-and-forget-it" profit producer, Robinson said.